Sonardyne AMTs measure vertical and horizontal displacement to detect any production induced seabed deformation. and horizontal displacements, a more continuous method of results from multiple AMTs, the effects of tide, water col- monitoring subsidence could be possible by taking vertical umn density and barometric pressure changes can be re- and horizontal measurements using long-term deployed sub- moved from the results leaving only the relative seabed sea instrumentation. At the time, suitable long-endurance and depth changes remaining. The system measured the horizontal distances between two sensor calibration in a process known as Ambient Zero locations on the sea? 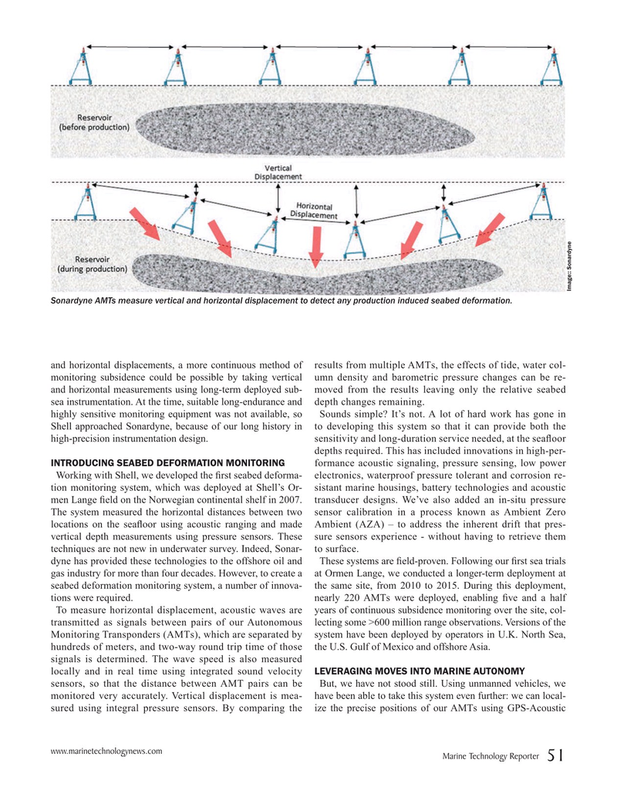 oor using acoustic ranging and made Ambient (AZA) – to address the inherent drift that pres- vertical depth measurements using pressure sensors. These sure sensors experience - without having to retrieve them techniques are not new in underwater survey. Indeed, Sonar- to surface. Monitoring Transponders (AMTs), which are separated by system have been deployed by operators in U.K. North Sea, hundreds of meters, and two-way round trip time of those the U.S. Gulf of Mexico and offshore Asia.